The National Chairman of the People for Democratic Change, Mudi Waziri, has urged the Indigenous People of Biafra to form a political party or join existing ones to pursue their cause. The PDC chief spoke on Saturday in Awka, the Anambra State capital, while handing over the flag of the party to its governorship candidate in the November 18 poll in the state, Mr. Peter Chibike. Waziri, who was represented by the State Chairman of the party, Mr. Isaac Onuka, said agitations on contentious issues in the polity were normal as key ingredients of participatory democracy. He condemned the call by IPOB for the boycott of the Anambra poll, describing such a move as backwardness. 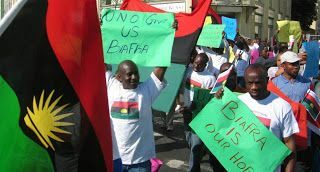 He said Biafran agitators should channel their grievances through recognised institutions and not through street protests. Waziri said, “The National Assembly and several lawful avenues are available to citizens and groups to make a change, seek redress and advance legitimate causes.